Kickapoo Area School District Superintendent Doug Olsen says it is difficult for small districts such as his to maintain programs. 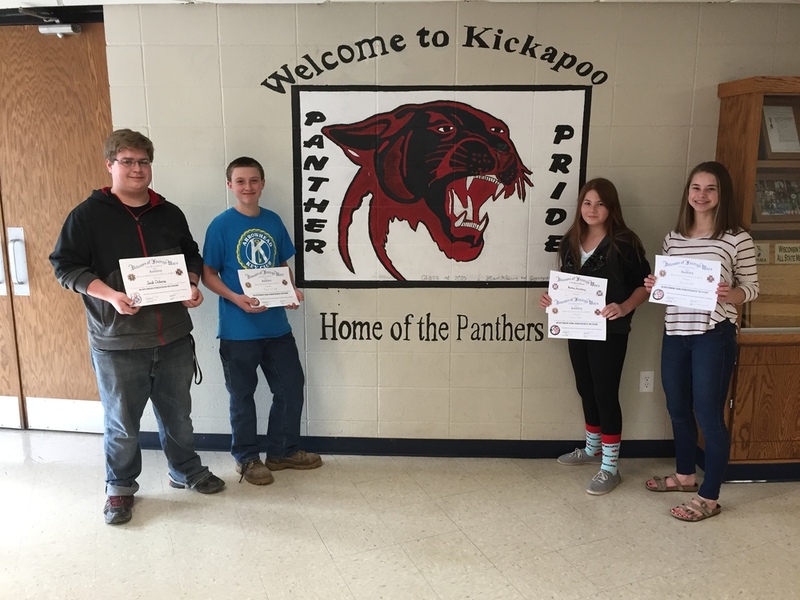 Here, Kickapoo students show off their certificates after winning awards in the Richland County VFW Patriot's Pen and Voice of Democracy contest. From left are students Jacob Osborne, John Schweiger, Tanisha Messer and Carrie Neefe. When you have a small school district and a limited budget, it comes down to choices, according to Kickapoo Area School District District Administrator Doug Olsen. For his district’s roughly 500 students, that often plays out in fewer electives and support staff. The experience of Kickapoo students, only three of them per square mile in the district, is different from that of the 26,968 students of the Madison Metropolitan School District. The Observatory checked a claim made by Sen. Janet Bewley, D-Ashland, that the state had reduced the level of increased funding that had been proposed for small rural districts such as Kickapoo in the 2017-19 budget. We found that while these schools will see more money thanks to a separate law signed this month, it is far short of the increase originally proposed at the start of the budget process. Olsen explained that small, rural districts typically can’t offer a “full plate” of electives, have a hard time hiring and retaining teachers and have higher transportation costs per student to bring them longer distances. For example, while Kickapoo no longer offers family and consumer education, the agriculture teacher blends jerky, sausage and ice cream-making and roasting into his agriculture processing class. “You kind of have to get creative,” Olsen said. The district also partners with nearby schools and University of Wisconsin-Platteville to offer more classes through distance learning, has staff play multiple roles — such as a school psychologist who doubles as a special education coordinator — and tries to draw more students through open enrollment to supplement their funding. Hannah Sherry, a UW-Madison sophomore and a Kickapoo graduate, said she loved the close relationships she developed with teachers and classmates, but there were downsides to a small curriculum. Wisconsin gives school districts a certain amount of money per student. Thus, districts like MMSD that enroll more students get more money than smaller rural schools. Kickapoo still has to maintain its single campus, which houses all grades. It also must offer extracurriculars, an attractive curriculum and competitive salary and benefits to staff. Olsen added it takes extra resources to meet the needs of Kickapoo students, about half of whom are considered economically disadvantaged, as well as manage the growing number of students who exhibit behavior problems. Attending to such extra needs can take away a district’s ability to invest in other opportunities, which is one reason Sherry said she doesn’t plan to teach at a small school like Kickapoo. To address the needs of small, rural school districts like Kickapoo, Wisconsin began the Sparsity Aid Program in 2008. Currently, it provides districts with less than 745 students and less than 10 students per square mile an extra $300 per student — an amount that will rise to $400 per student next school year. In the current school year, Kickapoo got $138,476 in sparsity aid. Olsen said these funds help the district create a competitive pay and benefits package to keep teachers and help cover needed maintenance at the district’s facilities. “It’s a significant impact, and it’s welcome,” Olsen said. Despite the economic disadvantage, Olsen said he isn’t worried that his students won’t be able to compete with students from larger, city schools. When the district offered a UW-Platteville English course, the seniors who enrolled did better than the UW-Platteville sophomores, he said. But he does worry that Kickapoo’s enrollment numbers may drop as the area’s farms are sold to Amish families who don’t traditionally send their children to public schools. That could mean Kickapoo would get less funding for fewer students and become less able to offer programs, possibly losing students to nearby schools. While both Olsen and Sherry acknowledged their small school’s financial issues, they are hopeful Wisconsin will solve its rural school funding problem. Nina Bertelsen is a journalist from St. Paul, Minnesota. Is President Trump’s trade war still hurting Wisconsin agriculture? In May, The Observatory reported about what President Donald Trump’s trade war could mean for Wisconsin farmers. Trump’s first round of tariffs on steel and aluminum imports in March brought concerns about volatile trade relations and higher costs of production for the farm industry. So what’s been happening to Wisconsin farms since then? Gov.-elect Tony Evers wants to cut Wisconsin’s prison population in half. Is that even possible?